Sarah Brice of the C&RT and Mary Green of the Worcester-Birmingham and Droitwich Canal Society planned a replanting with native species where the work had been done. 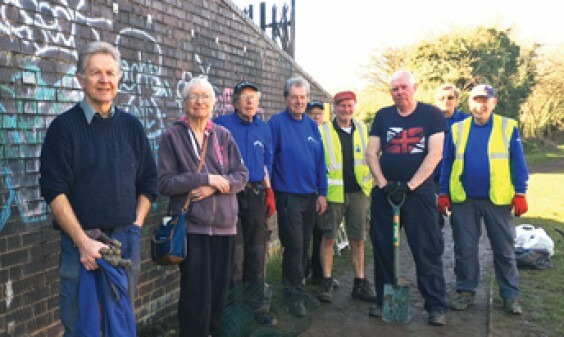 Sarah brought volunteers from C&RT and they were joined by more volunteers from the canal society, Alvechurch Village Society and Alvechurch Parish Council. On the old wall left behind from the bridge, which has unsightly graffiti, they put netting and planted native ivy, rose and hop to climb up it. On the other spaces they planted native cherry plum, wild cherry, field maple, sallow, spindle, guelder-rose, hawthorn, burnet-rose and holly. These are all flowering and fruiting species, so in time will provide good habitats for insects and birds. Andy Humphries, chair of Alvechurch Parish Council, thanked Sarah for the care taken in the whole project to maintain this important wildlife site around the Dead Arm. The area between the two arms is an excellent example of naturally-regenerated woodland, teeming with wildlife. As well as seeing swans pass, the volunteers saw the first brimstone butterfly of the season while they were planting in late February. Everyone involved hopes that local people will look after these trees and enjoy them for years to come.